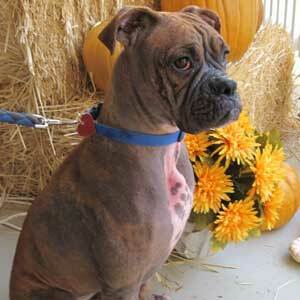 These are just a few of the Boxers who come to us in really bad shape and require extra medical attention. We will post periodic updates on our patients. As always, donations toward their medical care are greatly appreciated. Adult heartworms live in the heart and pulmonary arteries of infected dogs. They survive up to 5 years and during this time, the female produces millions of baby worms (microfilaria). These microfilaria live in the bloodstream, mainly in the small blood vessels. Heartworms are transmitted by mosquitoes. The female mosquito bites the infected dog and ingests the microfilariae during a blood meal. The microfilariae develop further for 10-30 days in the mosquito and then enter the mouth parts of the mosquito. The mosquito bites another dog and transmits the disease to that other dog. When fully developed, the infective larvae enter the bloodstream and move to the heart and adjacent vessels, where they grow to maturity in 2 to 3 months and start reproducing. Adult worms cause disease by clogging the heart and major blood vessels leading from the heart. They interfere with the valve action in the heart. By clogging the main blood vessels, the blood supply to other organs of the body is reduced, particularly the lungs, liver and kidneys, leading to malfunction of these organs. A lot of dogs infected with heartworms do not show any signs of disease for as long as two years. Unfortunately, by the time signs are seen, the disease is well advanced. The obvious signs of the disease are a soft, dry, chronic cough, shortness of breath, weakness, nervousness, listlessness and loss of stamina. A lot of these signs are most noticeable following exercise where dogs can faint from the lack of air passing through their lungs. There is some risk involved in treating dogs with heartworms. The treatment to kill adult worms is an injectable drug that will kill the worms in the heart and adjacent vessels over a period of about 30  45 days. Complete rest is essential after treatment: some adult worms die in a few days and start to decompose; the remainder will die during the 30-45 days. As they break up, they are carried to the lungs, where they lodge in the small blood vessels and are eventually reabsorbed by the body. This is a dangerous period, and is it essential that the dog be kept quiet and not be allowed to exercise. The first couple of weeks after the injections are very critical because the worms are dying. A cough is noticeable for 7 to 8 weeks after treatment in heavily infected dogs. 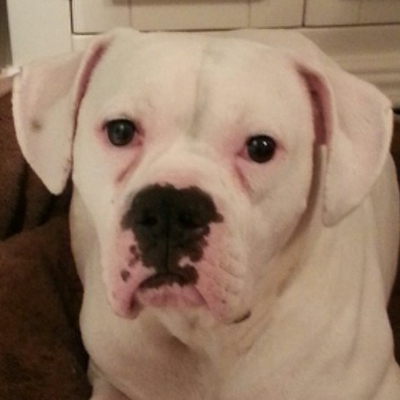 Donate to help all of our sick Boxers! The lesions and signs of demodectic mange usually involve hair loss; crusty, red skin; and at times, a greasy or moist appearance. The mites prefer to live in the hair follicles, so in most cases, hair loss is the first noted sign. 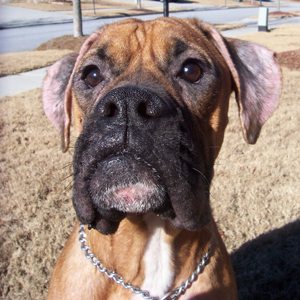 Usually, hair loss begins around the muzzle, eyes, and other areas on the head. The lesions may or may not itch. In localized mange, a few circular crusty areas will be noted, most frequently on the head and forelegs of young dogs 3-6 months of age. Most of these lesions will self heal as the puppies become older and develop their own immunity. Persistent lesions will need treatment. In cases in which the whole body is involved (generalized mange), there will be areas of hair loss over the entire coat, including the head, neck, abdomen, legs, and feet. The skin along the head, side, and back will be crusty and oftentimes inflamed. It will often crack and ooze a clear fluid. Hair will be scant, but the skin itself will often be oily to the touch. There is usually a secondary bacterial infection. Some animals can become quite ill and develop a fever, lose their appetite, and become lethargic. Patients with generalized demodectic mange need immediate vigorous treatment. 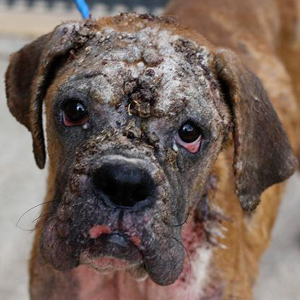 The treatment of Demodectic mange is usually accomplished with lotions, dips, and shampoos. Fortunately, 90% of demodectic mange cases are localized, in which only a few small areas are involved and can often be treated topically. Thanks to all of you who step forward to help save these sweet babies!